While the card was short and sweet, the first match of the night would be the longest, with Triple H walking out victorious with the WWE Title. Edge, the reigning champion, was eliminated very early (first) in the match, as the final two came down to HHH and Taker, with HHH pulling out the victory in a damn good Chamber match. 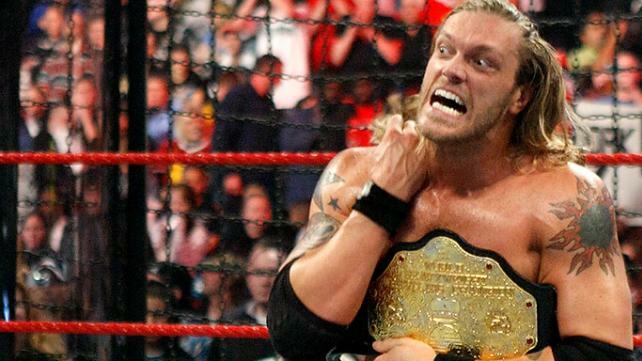 After Edge ended up losing his WWE Title, one had to question what his next move would be. Later on in the night we would find out what that was. Triple H celebrated his victory and would end up walking into Mania as the champion against the challenger Randy Orton who had won the Royal Rumble the month prior. Speaking of Orton, he put on a damn solid match with Shane McMahon continuing his issue with the McMahon family that saw the true rise of an intense Orton. Orton became the Viper during these days, the sick and sadistic version of himself and this match with Shane was pure brutal. Being a No Holds Barred match gave them more freedom and Shane works well in these conditions and matches, as does Orton. Orton got the victory with an extremely dope RKO and continued his path to the Wrestlemania main event and the WWE Title. In an irrelevant match of the night, Jack Swagger defended the pointless WWE version of the ECW title against Finlay, who had the soul crushing midget Hornswoggle in his corner. Unfortunately, this match was pretty bland, mostly because I had no concern for any of the participants of the actual match. Finlay and Swagger didn't have a bad match, it was just boring. Swagger retains here and despite WWE trying to promote and push ECW, this was completely a waste of time. Swagger seems to have had the most insignificant title runs of anybody in WWE, except maybe the Miz. Or Big Show. Wow. That's a trifecta of irrelevance right there. Speaking of irrelevant, one of the most irrelevant storylines during this era of WWE was the strange "HBK becomes JBL's servant storyline". I really can't imagine why they thought this was a good idea. HBK, a legend who was rich, turns to JBL to help and in turn becomes his servant on WWE TV. That storyline is confusing to me and I'll never get why they went with it, outside of just trying to find a different way to lead into a HBK vs JBL feud, which is the battle of folks who use acronyms for their names. HBK decided to break away from JBL and his control at one point, and this match was not bad by any stretch. Shawn leads the match of course, but JBL manages to keep up. Shawn walks away with the win here and sets himself on the path to go against the Undertaker for Mania in what I still believe is the greatest match of all time. Then, it would be time for our main event. After Edge beat up Kofi Kingston and took his spot in the World Heavyweight Title chamber match, we would witness something very fun and interesting in this match being done with Edge and his character. As the Ultimate Opportunist, Edge would sneak his way into the match and into the winner's circle, as he would walk away with the title in this match. Some great moments happened here in the match, one of which being the reigning champion Cena being eliminated earlier in the match, and leaving the final three to be Jericho, Rey and Edge. The final sequence between those three was awesome and Edge and Rey had a great back and forth to end the contest. Edge wins the title at the 30 minute mark and cashes in a ticket to go to Wrestlemania as champion. This would develop his character heavily going into the biggest event of the year and make him even stronger than before. All in all, this event was a solid watch, as both Chamber matches were very good and the No Holds Barred match along with HBK vs JBL was fun to revisit. If you've never seen this PPV before, I suggest pulling it up on the WWE Network and enjoying it. It's definitely underrated.